At the weekend I read David Grossman’s latest novel A Horse Walks Into a Bar. Now I want to set down some thoughts about this intense and unsettling book. On stage in a comedy club in an Israeli town, a stand-up comedian, Dovaleh G, settles into his usual routine of edgy gags and mocking, abusive comments about members of the audience. Slowly, though, the spectators realise that they are watching a man falling apart before their eyes as Dovaleh G unfolds the story of a childhood trauma from which he has never recovered. Since Grossman is a progressive Zionist and long-time advocate of peace and reconciliation between Israel and Palestine, does his novel stand as a metaphor for a wounded nation? Or is it the study of a man who presents a public face of cruelty and cynicism whilst hiding deep within himself the vulnerable yet irrepressible child crushed and betrayed by what happened to him one day in 1973. Reading a lot of the stuff written in the British press about John Berger following his death two days ago, I have barely been able to recognise the writer that I have known and loved from reading – a writer whose bibliography, according to Wikipedia, comprises ten novels, four plays, three collections of poetry and 33 other books, an unclassifiable blend of ruminations on art, politics and the simple joys and beauty of everyday life. The writer I am familiar with was certainly not the ‘bludgeoningly opinionated man’ of the Independent’s write up, nor the person depicted in the Guardian’s shoddy and mean-spirited obituary. I was ten years old when a small branch library opened in the Cheshire village where I grew up. Week after week I devoured novels, many of them beyond my childish comprehension. One of the books that did made a powerful impression on me that year was Exodus by Leon Uris. Published in 1958, Exodus was a hugely influential book, and I was one of those who were deeply affected by the romance of its story of Jews fleeing from post-Holocaust Europe and struggling to establish a new homeland against tremendous odds. However, as I learned more about the origins of the state of Israel and watched as the Arab-Israeli conflict intensified I discovered that Exodus was little more than duplicitous propaganda. When I first read the book at age 16, I responded to it mainly with my heart — whereas now I read it mostly with my head. Then, I fell in love with Uris’ Israel, which was populated by healthy, strong, lusty young men and women, the latter invariably described as ‘high-breasted’, which was thrilling in itself at that point in my development. They spent their days wearing blue shirts and short pants, working the land and fighting off Arab marauders, and their nights dancing the hora and making love while murmuring verses from the Song of Songs. ‘There was an aggressiveness and pride about them … and they were always filled with the songs and dances and ideals of the redemption of the homeland … These were the ancient Hebrews! These were the faces of Dan and Reuben and Judah and Ehphraim. These were Samsons and Deborahs and Joabs and Sauls,’ Uris breathlessly tells us. Uris’ Israel is very much the Israel of Labour Zionism and the kibbutz and moshav (agricultural co-op) movements. He buys into the concept of the ‘new Jew’ – the independent fighter so unlike the weak Jews of the Diaspora who had been left defenceless against the Nazis. Ari Ben Canaan himself is a ‘strapping six-footer with black hair and ice blue eyes who could be mistaken for a movie leading man. He doesn’t act like any Jew I’ve ever met. You don’t particularly think of them as fighters,’ one British character says. Like many others, I have made a long journey from Leon Uris’s racist fairytale in my understanding of the Israel – Palestinian question, a journey whose way-stations have been events on the ground such as the occupation and illegal settlement of the West Bank and the indiscriminate slaughter in Gaza, but also films and books which have documented the origins of the state of Israel and the expulsion of Palestinians from their homes and land. I recall 5 Broken Cameras, a superb documentary shot entirely in and around a Palestinian village near Ramallah in the occupied West Bank and Palestinian Walks, Raja Shehadeh’s brilliant amalgam of a walker’s lyrical account of the landscape he loves and of the unfolding political tragedy of occupation that has transformed the landscape, making him and many other Palestinians exiles in their own country. Both film and book share a similar approach to the subject of the Israeli occupation but approach the issue at a tangent. Raja Shehadeh comes at it by way of seven walks through the landscape he loves; for Emad Burnat in the film it’s watching how his youngest son Gibreel, born in 2005, is shaped by growing up in a village in the occupied territories while the Israeli Army builds a section of the Security Wall between their village and a nearby Jewish settlement. In both book and film, Palestinians reveal their profound emotions for the land that has sustained them for generations. Perhaps the most remarkable novel published after the 1948 ‘War of Independence’ aka Palestinian Nakba, or catastrophe, was written by an Israeli. Khirbet Khizeh (The Ruins of Hizeh), published in 1949, tells the story of the expulsion of Palestinian villagers from their home and land in 1948. The book was published under the nom-de-plume S. Yizhar, who was actually Yizhar Smilansky, an an intelligence officer in the Israeli army. Two more books have made a deep impression on me. 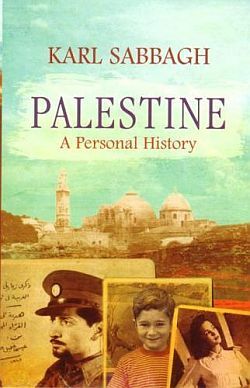 In Palestine: A Personal History, Karl Sabbagh combined his own family story with a historical outline of the Palestinian case against the Zionist project. While Sabbagh’s mother was English, his father was Palestinian, the descendent of a long line of Christian Arabs whose history he traces in the book as far back as the 18th century, when Palestine was an Ottoman province and his ancestor Ibrahim served at the Ottoman provincial court. Sabbagh wants to demonstrate the continuity and richness of the Palestinian Arab presence, both Christian and Muslim, in the region, and reject the Zionist assertion of title to ‘a land without people for a people without land’. 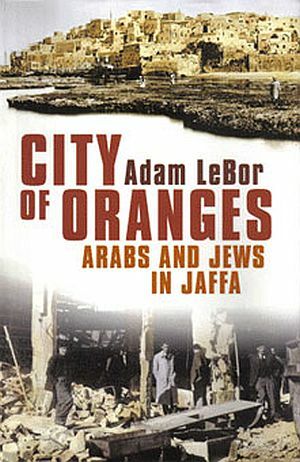 Adam LeBor’s City of Oranges: Arabs and Jews in Jaffa covers similar ground. Through the stories of six families – three Arab and three Jewish – LeBor tells the story of the ancient city of Jaffa, for centuries the main port of the eastern Mediterranean, home to Muslims, Christians and Jews, famed for the produce of its orange groves. LeBor begins his narrative in 1920, when the British took over the administration of the city under the Mandate. He traces Jaffa’s transformation from the second city of Palestine to a crumbling, semi-derelict and neglected suburb of the Israeli capital, and then its revival during the last two decades as an artist’s colony and a possible model of Arab-Jewish co-existence. LeBor draws upon hours of interviews with several generations of Jaffa families, on memoirs, letters and personal archives to tell the story of six families, three Arab, three Jewish. In the process he illuminates the underlying complexity of the makeup of modern Israel, by telling the story from both Ashkenazi and Sephardic perspectives, as well as from Christian Arab and Muslim points of view. 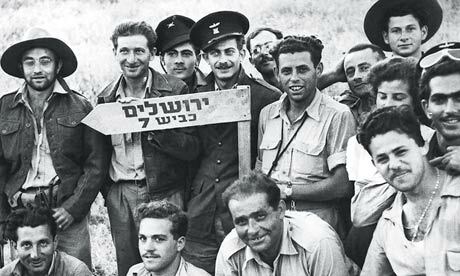 Through the eyes of these families LeBor builds as picture how the founding of the state of Israel was simultaneously a moment of jubilation for the Jews, and a disaster for the 100,000 Arabs who fled Jaffa in 1948, most of them never to return. It is salutary to reflect that the 75 years of political strife, civil conflict and outright war that LeBor covers in his book were the result of a promise made by a British politician, Arthur Balfour, former Conservative prime minister, to the then leader of the Jews in London, Lord Rothschild. Known as the Balfour declaration, these 69 words of contradictory obfuscation offered the same land to two different peoples, and was the very moment that the dark genie of Arab-Jewish conflict was released from its bottle. A British administration then presided over the ensuing troubles for 30 years until they abandoned it, exhausted and baffled that the peoples of Palestine had not thanked them for the confusion and injustice. Not least for these reasons it is important that Britons remain morally engaged with the fate of the region. A good place to start would be to read Adam LeBor’s excellent and courageous book. This brings me to the most recent book that I have read about this seemingly intractable conflict. Highly recommended by several friends, Sandy Tolan’s The Lemon Tree was published in 2006. Tolan is an experienced American journalist and his book is a meticulously-researched work of intelligent journalism. What he has attempted in The Lemon Tree – and has largely succeeded in achieving – is to present an accurate history of the Palestine-Israel conflict through the true story of a Palestinian family driven from their ancestral home in the town of al-Ramla in 1948 by the Palmach, the elite Israeli fighting force, following an order from Yitzhak Rabin, (decades later to be awarded the 1994 Nobel Peace Prize for his role in the signing of the Oslo Accords, which created the Palestinian National Authority and granted it partial control over parts of the Gaza Strip and West Bank before being assassinated a year later by a right-wing Orthodox Jew who opposed the signing of the Oslo Accords). Tolan’s good fortune was not only to find a dispossessed Palestinian family, but also to discover the story of how, in 1967 following the Six-Day War which had overnight made him a citizen of the newly-occupied territory on the West Bank, Bashir Al-Khairi returned with two cousins to his childhood home, lived in since 1948 by the Eshkenazis, Jewish refugees from Bulgaria. There they were met by Dalia Eshkenazi who welcomed them into the old family home, an encounter that is the starting point for Tolan’s story of a relationship forged against the odds between two families, one Arab, one Jewish, and specifically between Dalia and Bashir, two individuals with very different perspectives on the conflict. Before long, Ahmad would turn his attention to the garden. In the corner of the yard behind the house, he had chosen a spot for a lemon tree. Once the tree was in the soil, Ahmad knew it would be at least seven years, and probably more, before the strong Palestinian sun and sweet waters of the al-Ramla aquifer would nurture the tree to maturity. The act of planting was thus an act of faith and patience. At home the Khairis … and the rest of the people of al-Ramla had left behind their couches and tables, rugs, libraries, framed family pictures, and their blankets, dishes and cups. They left their fezzes and gallabiyas, balloon pants, spare keffiyehs, sashes, and belts. They left their spices for maklouheh, grape leaves in brine, and the flour for the dough of their date pastries. They left their fields of wild peas and jasmine, passiflora and dried scarlet anemone, mountain lilies that grew between the barley and the wheat. They left their olives and oranges, lemons and apricots, spinach and okra and peppers. They left their silk and linen, silver bracelets and chokers, amber, coral, and necklaces with Austrian coins. They left their pottery and soaps, leather and oils, Swedish ovens and copper pots, and drinking goblets from Bohemia. They left their silver trays filled with sugared almonds and sweet dried chickpeas; their dolls, made with glued-together wood chips; their sumac; their indigo. The Arab Legion has wired that there are 30,000 refugees moving along the road between Lydda and Ramla, who are infuriated with the Legion. They’re demanding bread. They should be taken across the Jordan River’. In other words, removed from Palestine to the Kingdom of Jordan – ethnically cleansed if you will. 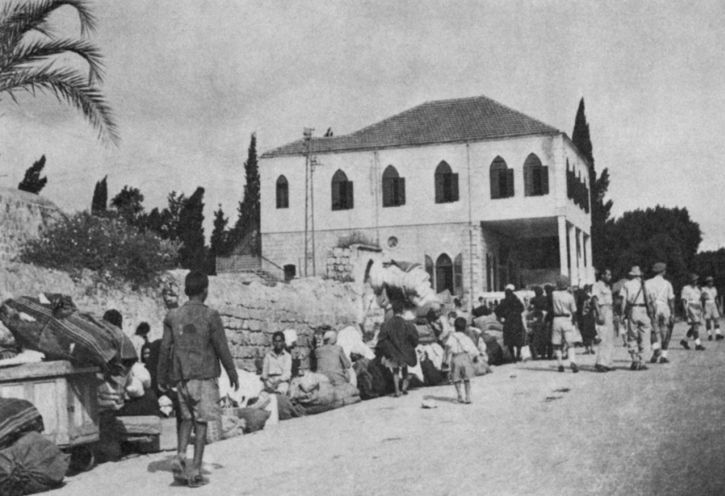 In mid-July, the Khairis arrived in Ramallah, along with thousands of other refugees. Ramallah ‘had been transformed from a quiet Christian hill town in northern Palestine to a depository of misery and trauma’, writes Tolan. This was where the family would remain, and where Bashir would grow up, eventually training to be a lawyer. They were greeted by a representative of the Jewish Agency. … It was a simple procedure, immigrants would recall; they were free to enter a house, inspect it, and claim it. The paperwork would come later. Moshe and Solia came upon a house to their liking. It was in good shape and virtually empty, though not brand-new. Clearly, someone had lived there before. It was a stone house with an open layout and plenty of space. … In the yard in back there was a lemon tree. In a black and white photograph taken in the backyard of the stone house in Ramla, Dalia stands beside a lemon tree, looking into the camera with tears in her eyes. The image was taken in the summer, perhaps of 1950; Dalia would have been two and a half. She’d been crying briefly, offended by the sparrows who had chosen to fly away rather than stay and eat bread crumbs out of her hand. ‘Why should they fly?’ she cried to her aunt. ‘Why? I love them.’ It is her earliest memory. In the evenings, Moshe and Solia would invite Bulgarian friends for gatherings in the backyard. They laid out plates of black olives, watermelon and Bulgarian chees, pouring glasses of boza, a sweet Balkan drink made from wheat. They’d talk of news from Bulgaria, and Dalia would hear them telling off-colour jokes in Ladino, the fading language of earlier generations that she could understand only slightly. It is important to note, when reading passages such as these, with their fictionalised tone, that Tolan has been meticulous in ensuring that everything in the book, down to the smallest detail, is fact, gained from the journalist’s tools – interviews, archival documents, published and unpublished memoirs and diaries, newspaper clippings, and primary historical accounts. ‘I have not taken liberties with the history, no matter how minor’, he writes. ‘At no point do I imagine what probably happened, for example at a family event in 1936 and state it as fact; nor at any moment do I describe what someone was thinking unless those thoughts are based on a specific recounting in a memoir or interview’. ‘These are Arab houses,’ she was told. ‘What are these Arab houses that everyone talks about?’ she would reply. Dalia’s school was in an Arab house, and there she would learn Israel’s history. She learned about the creation of the state of Israel as a safe haven for the Jews. She studied the War of Independence as the story of the few against the many. The Arabs had invaded, Dalia would read, in order to destroy the new state and throw the Jews into the sea. Most nations confronted with such hostilities would have been paralyzed, but tiny Israel had withstood five Arab armies. Little David had defeated Goliath. As for the Arabs, Dalia’s text-books would report that they ran away, deserting their lands and abandoning their homes, fleeing before the conquering Israeli army. The Arabs, one textbook of the day declared, ‘preferred to leave’ once the Jews had taken their towns. Dalia accepted the history she was taught. Still, she was confused. Why, she wondered, would anyone leave so willingly? One afternoon when she was about seven or eight years old, Dalia climbed up the black metal gate that Ahmad Khairi had placed at the end of the stone path in the front yard. Atop the gate perched a delicate piece of wrought iron in the shape of a star and crescent: the symbol of Islam. It bothered Dalia. ‘This is not an Arab house,’ she said to herself, and she grasped the delicate crescent and began wrenching it back and forth, back and forth, until it came loose in her hands. She clambered down and threw the crescent away. Tolan sets the story of his two families against the background of the history of the conflict, told in the clearest way. Every statement is supported by references, not in footnotes in the text itself, but in a 70-page appendix and extensive bibliography which together constitute a quarter of the book. 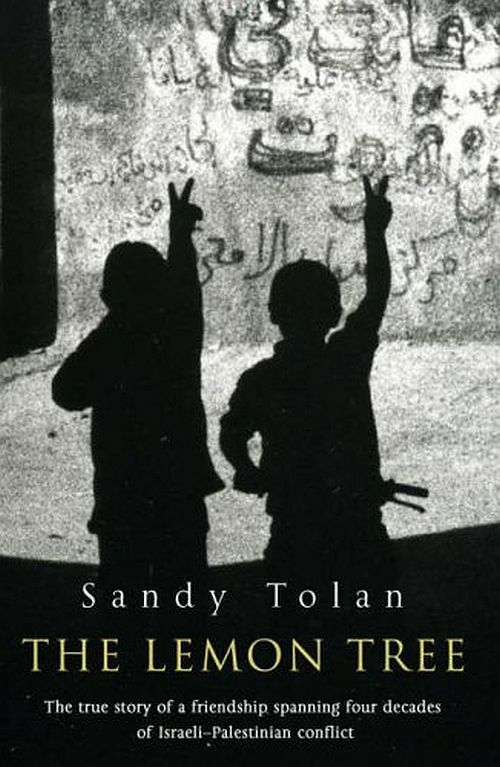 Tolan skilfully shows how Dalia and Bashir are both swept up in the fates of their people, and reveals their lives as a personal microcosm of more than half a century of Israeli-Palestinian history. Meanwhile, the Khairis had lived as exiles in their own land – first in Ramallah, then in Gaza, and finally returning to Ramallah when Bashir was fifteen years old. In the early 1960s, in Cairo studying law, Bashir had become deeply involved in activist politics, and particularly with the Arab Nationalist Movement led by George Habash, himself a refugee from Lydda who had been among the refugees who had walked in the heat through the hills to Ramallah in July 1948. It was a universal welcome – Make yourself at home; Mi casa es su casa; Ahlan wa-sahlan; Baruch habah – yet these particular words seemed especially strange to Bashir as he approached the front door: Feel at home. As the cousins are shown around the house they see the bedroom that is now Dalia’s but was once Bashir’s. 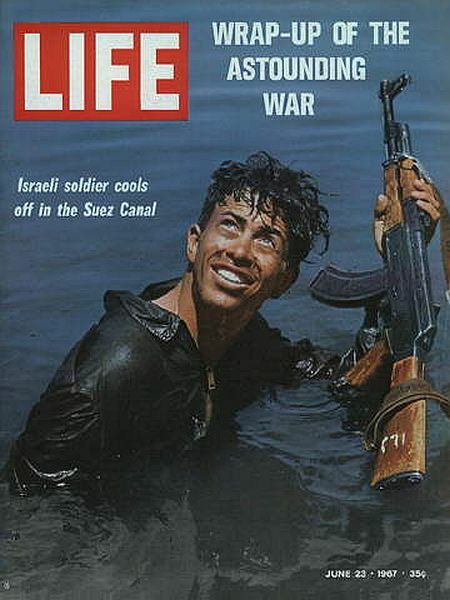 On the wall above her bed Dalia has tacked a poster of an Israeli soldier celebrating in the Suez Canal after the overwhelming Israeli victory in the Six Days War of 1967. For Israelis the image stood for liberation and survival, but standing with Bashir in the doorway to the bedroom, Dalia suddenly realises, for the first time, that Bashir might see the poster differently. In his childhood home, in the lemon tree his father planted in the backyard, Bashir sees dispossession and exile; Dalia, who arrived as an infant in 1948 with her family from Bulgaria, sees hope for a people devastated by the Holocaust. 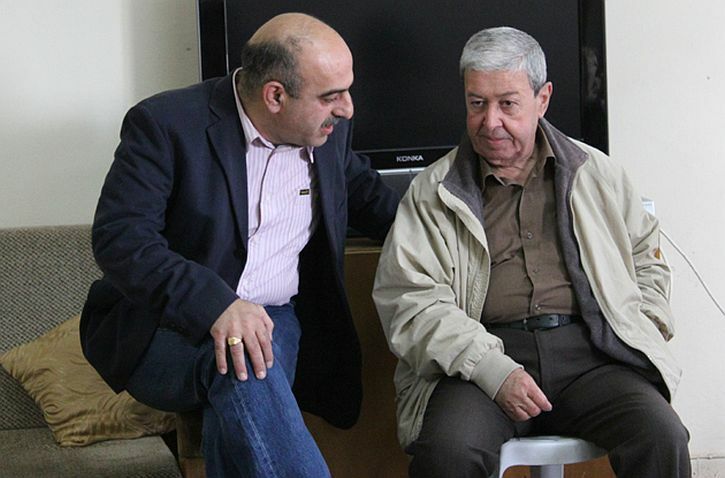 Nevertheless, from this unpromising encounter a long friendship develops, even though Bashir becomes a senior member of the politburo of the Popular Front for the Liberation of Palestine (PFLP), and is charged with being involved in the bombing of a supermarket in Jerusalem in 1969. Bashir spends two decades in a total of 17 Israeli prisons, detained after hearings in closed Israeli military courts on suspicion of links to acts of terror carried out by the PFLP, and for helping to organize the first intifada. Bashir remains committed to a programme of resistance to gain for dispossessed Palestinians the right to return to their homeland. Despite Bashir’s circumstances and politics, Dalia maintains a friendship with the Palestinian, and begins to understand Bashir’s grievances about his family’s lost home. In 1991, she donates the house as a kindergarten for Arab children in al-Ramla and as a peace and educational centre called Open House which is still operating today. The Nakba remains little known in the West, despite the rivers of ink and forests of newsprint that have chronicled the last six decades of struggle between the two peoples. Yet it is as central to Palestinian identity as the Holocaust is to the identity of Israel. Seen through a Palestinian lens, the creation of Israel, sanctioned by the United Nations vote, in November 1947, to partition Palestine into two states – one for the Arabs, and one for the Jews – was not ‘western civilization’s gesture of repentance for the Holocaust,’ as the historian Michael J. Cohen has written. Rather, Palestinians saw themselves as ‘the indigenous majority on its ancestral soil,’ as the Harvard scholar Walid Khalidi has noted, and therefore ‘failed understand why they should be made to pay for the Holocaust.’ Neither did they grasp why the Jewish side, with one third the population, should be awarded 54 percent of Palestine and more than 80 percent of its cultivated citrus and grain plantations. This helps explain why the Arabs of Palestine, in peace talks five and six decades later, would fail to see Israeli concessions as ‘generous’: From their perspective, they lost 78 percent of their land to Israel in the 1948 war, and are ill-inclined to make further compromise on the 22 percent that remains. Curiously, although Tolan’s book takes as its focus 1948 and the story of one house that changed hands in that year, I gained a greater sense from his historical account of the greater significance, not of the Holocaust, but of Zionism as being fundamental to understanding Israeli justifications for policies of territorial conquest and occupation. A liberal delicacy often surrounds the question of Israel, rooted quite naturally in the idea of the state as a refuge for Jews who had survived the Holocaust in Europe. But the historical background sketched in by Tolan (or contained in many other histories) confirms the origins of the problem: the Zionist dream of Jewish homeland, a religious state in which Jews would be a majority in their own nation in a territory closely approximating the historical Eretz Yisrael. With its roots in 19th century Europe, and gathering pace following the British acceptance of ‘the establishment in Palestine of a national home for the Jewish people’ in the 1917 Balfour Declaration, the Zionist project clearly pre-dates the Holocaust. The Zionist belief that the settlers were returning to a ‘land without people for a people without land’ soon provoked the first stirrings of nationalism among the Palestinian Arab population. The house and the lemon tree. However the history is interpreted, the evidence is plain: in 1948 some 700,000 Palestinians were driven from their homes. Although they maintain their friendship and shared commitment to the Open House, Bashir and Dalia cannot come to any kind of agreement about the ‘right of return’: in other words, the right for Palestinian refugees to return to their homes in Israel and have access to their stolen property. 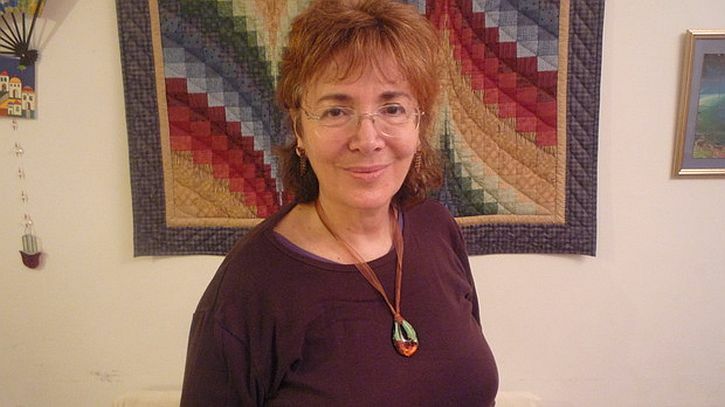 Dalia can understand the right to return as a recognition of a past injustice, but for her it can never be, practically speaking, put into place because of the suffering it would cause Israelis and its implication for the state of Israel. For Bashir, return is simply everything he has believed in and worked towards. Dalia’s arms were folded tightly across her chest. She unfolded them and took a breath. ‘Bashir. Maybe I have no right to say what I’m going to say. We need to make sacrifices if both of us are to live here. We need to make sacrifices. And I know it’s not fair for me to say that. I know. I mean, you cannot live in your house in Ramla. I know it’s not fair. But I think we need to strengthen these people who are willing to make some compromise. Like Rabin, who paid with his life. … By not accepting the state of Israel or by not accepting the state of Palestine, I think none of us has a real life here. Israelis don’t have a real life here, either. But if you’re not okay, we’re not okay. And if we’re not okay, you’re not okay. The last time I saw Bashir was with Sandy Tolan in about 2006. He can’t come to Israel; he doesn’t have a permit because he was allegedly involved in an act of terror (a supermarket bombing) in 1969. Has he ever admitted his crime? I don’t know what he admitted or didn’t admit in court because it was behind closed doors. I have confronted him with this and he has never said that he did NOT do this. He just said ‘why do you call these people terrorists? They are freedom fighters’, so what do you understand from this? But he’s still your friend and that’s how you see him? I see him as something that grows from the same earth, from the same hole, in a way somehow part of my fate, shall we say, like family. It’s a very strong connection, to know that you’ve been living in someone else’s house. She has an extraordinary conscience. She offered me back the house because it released her conscience from having a house belonging to someone else. Dalia supports a two-state solution for Israel and Palestine. This is the official U.S. position despite the Israeli settlements throughout the West Bank, East Jerusalem and Gaza that put to question its feasibility. Khairi disagrees. For me, too, one state seems the solution. Though it might appear as much pie in the sky as a democratic South Africa with a black president would have seemed 40 or 50 years ago, I have believed it to be the only outcome that guarantees any justice and security since reading the late Tony Judt’s Reappraisals: Reflections on the Forgotten Twentieth Century. This week the House of Commons voted overwhelming in favour of recognition for the state of Palestine. But how can there be a viable Palestinian state when Israel refuses to relinquish control of the occupied territories where illegal Jewish settlements continue to spread? Surely there is a matter of principle here? When the world demanded the dismantling of apartheid in South Africa, there was no suggestion that a just outcome would be white control of the greater part of the territory while granting black South Africans independence in the bantustans or homelands. Like Bashir, I believe that only a single secular, democratic state will guarantee peace and justice for all. Beware ! Beware ! Beware ! How does one avoid despair at the news these days? It’s been a terrible few weeks: death and destruction in Ukraine, Iraq, Syria and Libya, all overshadowed by the appalling events in Gaza. This morning’s Guardian adds to the gloom with news that 40,000 Kurds from a minority sect of Zoroastrians are surrounded by jihadist forces of Isis on Mount Sinjar in northern Iraq, known in local legend as the final resting place of Noah’s ark. Alongside that is a report by from Israel by Giles Fraser (one-time Canon of St Paul’s Cathedral, who resigned during the Occupy encampment there). In it, he paints a picture of an Israel in which there is almost total support for the war in Gaza, newspapers and TV channels are ‘simply cheerleaders for the government line, offering a constant diet of fear and fallen heroes, with little evidence of any of the atrocities going on in Gaza’, and peace activists are fearful of making a public stand. He says something that feels to me like a real shift in his position. Previously he has described the Israeli/Palestinian conflict as a Sophoclean tragedy over land in which both sides have a claim to right on their side; as a battle, as he put it of ‘right versus right’. But now, he says, this is a battle of ‘wrong versus wrong’. Who are the good guys? That’s what every well-meaning European, left-wing European, intellectual European, liberal European always wants to know, first and foremost. Who are the good guys in the film and who are the bad guys. In this respect Vietnam was easy: The Vietnamese people were the victims, and the Americans were the bad guys. The same with apartheid: You could easily see that apartheid was a crime and that the struggle for civil rights, for liberation and equality, and for human dignity was right. The struggle between colonialism and imperialism, on the one hand, and the victims of colonialism and imperialism, on the other, seems relatively simple–you can tell the good guys from the bad. When it comes to the foundations of the Israeli-Arab conflict, in particular the Israeli-Palestinian conflict, things are not so straightforward. And I am afraid I am not going to make things any easier for you by saying simply: These are the angels, these are the devils; you just have to support the angels, and good will prevail over evil. The Israeli-Palestinian conflict is not a Wild West movie. It is not a struggle between good and evil, rather it is a tragedy in the ancient and most precise sense of the word: a clash between right and right, a clash between one very powerful, deep, and convincing claim, and another very different but no less convincing, no less powerful, no less humane claim. People in Europe keep sending me wonderful invitations to spend a rosy weekend in a delightful resort with Palestinian partners, Palestinian colleagues, Palestinian counterparts, so that we can learn to know one another, to like one another, to drink a cup of coffee together, so that we realize that no one has horns and tails–and the trouble will go away. This is based on the widespread sentimental European idea that every conflict is essentially no more than a misunderstanding. A little group therapy, a touch of family counselling, and everyone will live happily ever after. Well, first, I have bad news for you: Some conflicts are very real; they are much worse than a mere misunderstanding. And then I have some sensational news for you: There is no essential misunderstanding between Palestinian Arab and Israeli Jew. The Palestinians want the land they call Palestine. They have very strong reasons to want it. The Israeli Jews want exactly the same land for exactly the same reasons, which provides for a perfect understanding between the parties, and for a terrible tragedy. Rivers of coffee drunk together cannot extinguish the tragedy of two peoples claiming, and I think rightly claiming, the same small country as their one and only national homeland in the whole world. So, drinking coffee together is wonderful and I’m all for it, especially if it is Arabic coffee, which is infinitely better than Israeli coffee. But drinking coffee cannot do away with the trouble. But, drinking coffee cannot do away with the trouble. What we need is not just coffee and a better understanding. What we need is a painful compromise. The word compromise has a terrible reputation in Europe. Especially among young idealists, who always regard compromise as opportunism, as something dishonest, as something sneaky and shady, as a mark of a lack of integrity. Not in my vocabulary. For me the word compromise means life. And the opposite of compromise is not idealism, not devotion; the opposite of compromise is fanaticism and death. We need a compromise. Compromise, not capitulation. A compromise means that the Palestinian people should never go down on its knees, neither should the Israeli Jewish people. When Israeli Prime Minister Yitzhak Rabin was awarded the Nobel Peace Prize in 1994, Amichai was invited to read from his poems at the ceremony in Oslo. ‘God has pity on kindergarten children’ was one of the poems he read that day. Less than a year later, Yitzhak Rabin was assassinated at a peace rally in Tel Aviv by a right-wing Orthodox Jew who opposed the signing of the Oslo Accords in 1993. 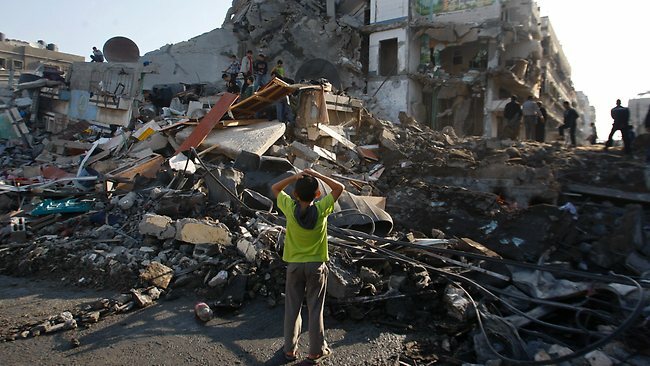 In the weeks just gone there has been no mercy in Gaza even for kindergarten children. sleeping on a public bench. The events of this summer have echoed with chilling synchronicity those of one hundred summers past. As the forces of Isis have swept all before them this summer, determined to eradicate the borders established by the colonial powers in the Middle East at the end of the First World War, we have been made painfully aware of the loose ends left by that war in eastern Europe and the Middle East. In a blog post the other day, Mary Beard wrote about attending the commemorative event at the St Symphorien cemetery near Mons on Monday. Everyone there was given a booklet by the Commonwealth War Graves Commission explaining how many graves the commission looks after and where they are. Flipping through it, Mary Beard discovered with a shock that there are over 3000 graves in Gaza from the Great War. They hold the remains of British soldiers who fought to take Gaza city in 1917. It is a reminder, Beard wrote, ‘of a complicated story of conflict in that region which reaches down a century’. Coincidentally, on Monday’s Channel 4 News, Paul Mason visited the Deir al-Balah cemetery which had been hit by a couple of Israeli shells. 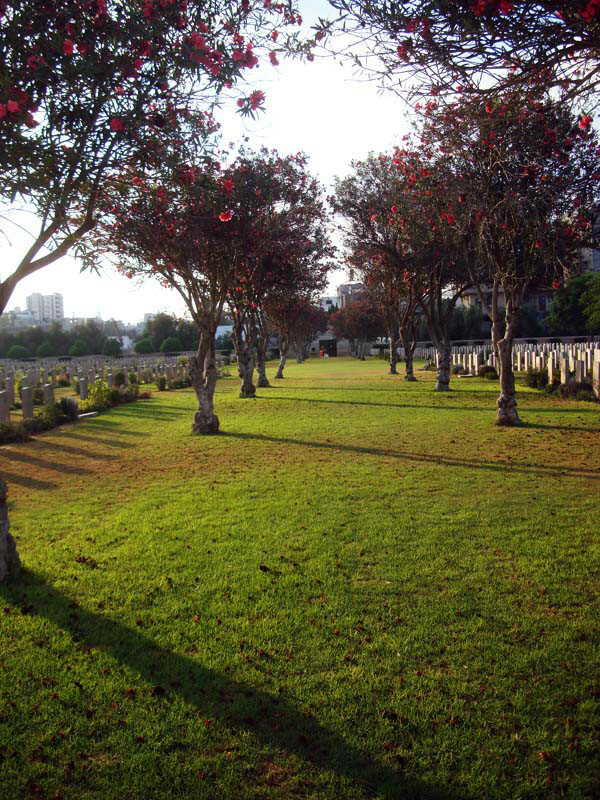 The cemetery, which is in the centre of Gaza, has been maintained by the same Palestinian family for three generations, and was badly damaged by shelling in 2009. 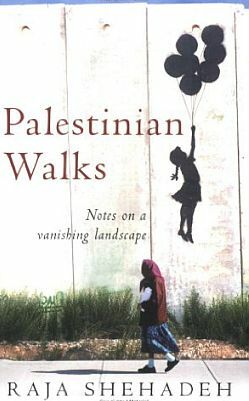 I’ve only just got round to reading Palestinian Walks: Notes on a Vanishing Landscape, even though it’s been in the house for three or four years. I had been reminded of Raja Shehadeh’s book while reading Robert MacFarlane’s The Old Ways, in which MacFarlane writes of joining Shehadeh, an old friend and walking companion, for the first time on a walk near Ramallah in the Occupied Territories. Shehadeh’s book was first published in the UK in 2007, and I should have read it much sooner. It’s a brilliant amalgam of a walker’s lyrical account of the landscape he loves and of the unfolding political tragedy of occupation that has transformed the landscape, making him and many other Palestinians exiles in their own country. Raja Shehadeh is a lawyer, novelist and political activist who has lived on the West Bank since his family fled Jaffa in 1948. He is a founder of the human rights organisation Al-Haq, and in 2008 was awarded the Orwell prize for political writing for Palestinian Walks. 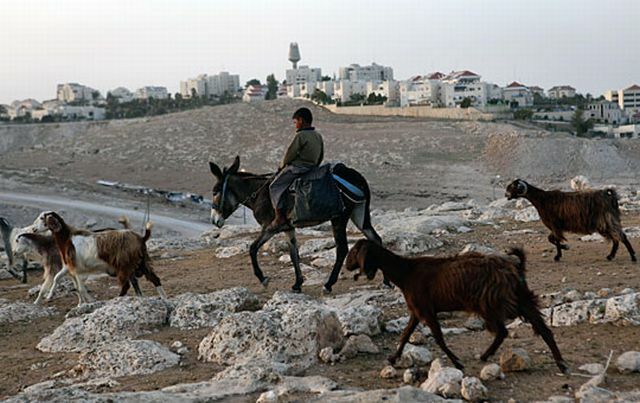 For decades, as a temporary escape from the stress and disappointments of legal appeals against Israeli orders expropriating Palestinian land for Jewish settlements, Raja has found comfort in walking, following what in Arab culture is called sarha – meaning to roam freely, at will, without restraint: to go where the spirit takes you. In Palestinian Walks he invites the reader to accompany him on six walks that span a period of twenty six years. Walking through the undulating hills and wadis of the West Bank, Shehadeh evocatively describes the natural beauty of his homeland: valleys where, after spring rains, wildflowers bloom in profusion with cyclamen, thyme, poppies and asphodels. As he wanders, Shehadeh passes olive groves and fruit trees, encounters gazelles and goats. As he walks, Shehadeh meditates on Palestine’s history and political struggles, and his growing sense of disappointment and disillusionment with the Palestinian leadership after the signing of the Oslo Accord in 1993, which he sees in legal terms as a key strategic error that opened the way to the process which has transformed the landscape he loves – and the fate of his people, as one West Bank hilltop after another is claimed by the Israeli authorities and yet more settlements are established, the familiar view changes beyond recognition. 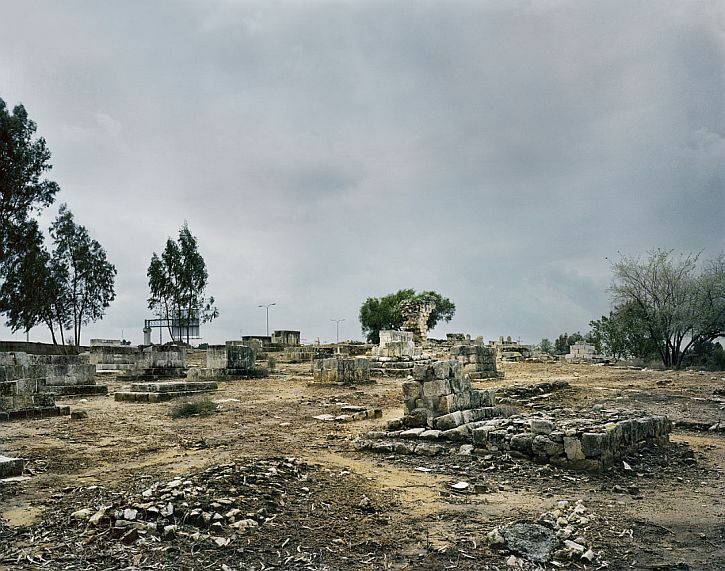 So Palestinian Walks is an elegy for a vanishing landscape. The beautiful hills, rivers and sacred springs, and the landmarks familiar to him from childhood are being concreted over, torn apart by new highways that connect the settlements that rise on the hilltops. The Dead Sea recedes a metre every year as a consequence of Israel’s diversion of the river Jordan. Along with his compatriots, Shehadeh experiences everyday humiliations and harassment by Israeli soldiers and settlers – and, for him much worse, many of the paths through the wadis can no longer be walked, out of bounds to a Palestinian. As a child I used to hear how my grandfather, Judge Saleem, liked nothing more than coming to Ramallah in the hot summer and going on a sarha with his cousin, Abu Ameen, leaving behind the humid coastal city of Jaffa and the stultifying colonial administration which he served and whose politics he detested. It was mainly young men who went on these expeditions. They would take a few provisions and go to the open hills, disappear for the whole day, sometimes for weeks and months. They often didn’t have a particular destination. To go on a sarha was to roam freely, at will, without restraint. The verb form of the word means to let the cattle out to pasture early in the morning, leaving them to wander and graze at liberty. The commonly used noun sarha is a colloquial corruption of the classical word. A man going on a sarha wanders aimlessly, not restricted by time and place, going where his spirit takes him to nourish his soul and rejuvenate himself. But not any excursion would qualify as a sarha. Going on a sarha implies letting go. It is a drug-free high, Palestinian-style. His book concludes on a shared high – a drug-induced one – in an account of a walk entitled ‘An Imagined Sarha‘. You wonder, as you read, whether this walk actually happened, or whether his narrative is a metaphor for Shehadeh’s mixture of hope and despair for the future. On this last journey he encounters a young Jewish settler – a man with ‘kind, intelligent eyes’ and a ‘soft, kind voice …almost apologetic, most untypical of an Israeli’ – a man who, like Shehadeh, had grown up and spent his life in the very same hills. The man performs a small act of kindness, and, unwillingly at first, Shehadeh falls into conversation with him. All the tension of the times, the worry about going through area C, the likely prospect of encountering soldiers or settlers, or getting shot at or lost, was evaporating. With every new draw of the nergila, I was slipping back into myself, into a vision of the land before it became so tortured and distorted, every hill, watercourse and rock, and we the inhabitants along with it. This young man was an artist at preparing a good nergila, I thought. He had talent. “What’s in this?” I asked. I was fully aware of the looming tragedy and war that lay ahead for both of us, Palestinian Arab and Israeli Jew. But for now, he and I could sit together for a respite, for a smoke, joined temporarily by our mutual love of the land. Shots could be heard in the distance, which made us both shiver. “Yours or ours?” I asked. But how could we tell? We agreed to disregard them for now and for a while the only sound that we could hear was the comforting gurgle of the nergila and the soft murmur of the precious water trickling between the rocks. 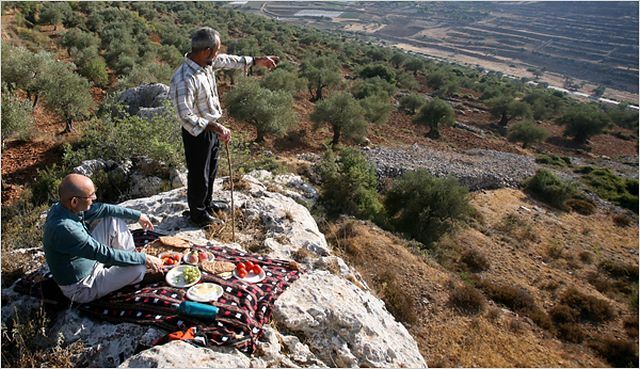 Raja Shehadeh, left, with a Palestinian farmer on a hillside overlooking Ramallah, West Bank. The six preceding chapters of Shehadeh’s book do more than describe the landscape through which he walks; each walk takes place at a different stage of the recent history of the Palestinian people and maps his changing mood. At first he describes his attempts as an idealistic lawyer to uphold legitimate Palestinian claims to land, but as case after case is decided against his clients, he becomes increasingly angry, embittered and disillusioned. 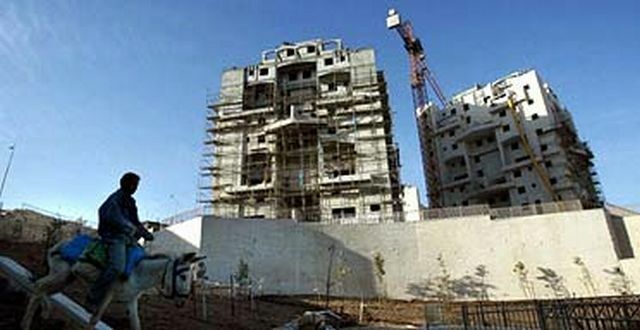 Where once he was pleased the Israeli authorities were designating certain areas as nature reserves, he changes his mind when those areas were closed to Palestinians after the Oslo self-rule agreement in 1993 – a catastrophic error in his judgement, resulting in a doubling of the number of Jewish settlements since then. He sees raw sewage from the settlements pouring untreated onto the land of Palestinian farmers. He recognises the psychological damage ordinary people are suffering, and admits to his own ‘internalised defeat’ as the idealism of resistance gives way to a sense of helplessness (as much in the face of the corruption of the Palestinian Authority as the injustices of the Israeli occupation). 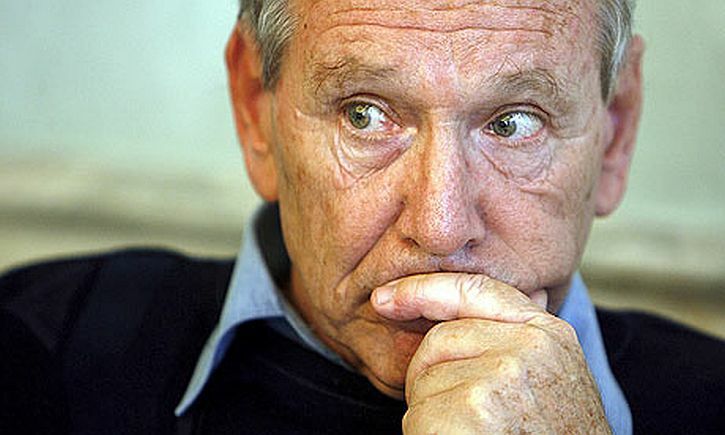 Above all, he begins to sense that the changes he is observing are irreversible: he quotes Ariel Sharon in 1980, then Israel’s defence minister, as promising ‘a new map of the country’. When I began hill walking in Palestine a quarter of a century ago, I was not aware that I was travelling through a vanishing landscape. For centuries the central highland hills of Palestine, which slope on one side towards the sea and on the other towards the desert, had remained relatively unchanged. As I grew up in Ramallah, the land from my city to the northern city of Nablus might, with a small stretch of the imagination, have seemed familiar to a contemporary of Christ. Those hills were, I believe, one of the natural treasures of the world. All my life I have lived in houses that overlook the Ramallah hills. I have related to them like my own private backyard, whether for walks, picnics or flower-picking expeditions. I have watched their changing colours during the day and over the seasons as well as during an unending sequence of wars. I have always loved hill walking, whether in Palestine, the Swiss Alps or the Highlands and outlying islands of Scotland, where it was a particular joy to ramble without fear of harassment and the distracting awareness of imminent political and physical disasters. I began taking long walks in Palestine in the late 1970s. This was before many of the irreversible changes that blighted the land began to take place. The hills then were like one large nature reserve with all the unspoiled beauty and freedom unique to such areas. As our Palestinian world shrinks, that of the Israelis expands, with more settlements being built, destroying for ever the wadis and cliffs, flattening hills and transforming the precious land which many Palestinians will never know. In the course of a mere three decades close to half a million Jewish people were settled within an area of only 5,900 square kilometres. The damage caused to the land by the infrastructural work necessary to sustain the life of such a large population, with enormous amounts of concrete poured to build entire cities in hills that had remained untouched for centuries, is not difficult to appreciate. I witnessed this complete transformation near where I grew up and I write about it here. Beautiful wadis, springs, cliffs and ancient ruins were destroyed, by those who claim a superior love of the land. By trying to record how the land felt and looked before this calamity I hope to preserve, at least in words, what has been lost for ever. Shehadeh’s narrative is peppered with the moving stories of those whose rights to their land he tries to defend as a lawyer. For example, he tells of Ayoub, an old distant relative, ‘as strong and as nimble as a goat’, who built a qasr (a farmer’s house on the hills) with his new wife during their honeymoon. The building of a qasr is usually a communal business, but being an only child and having cousins who had emigrated to America to study and were, in his terms, ‘useless’, Ayoub decides to tackle the work by himself. He goes to the hill property and, with his wife Zariefeh, starts clearing ground and carrying large blocks of stone. In the evening, they light a fire to keep warm and keep the jackals off, and they spend the night in the open air. For a week, they work together until Ayoub has built a perfect qasr entirely out of stone, with no cement. For Ayub this is paradise: on his beloved hills in God’s open country. But the most destructive development, which boded only misery and spelled continued conflict for the future, was the wall being constructed by Israel. 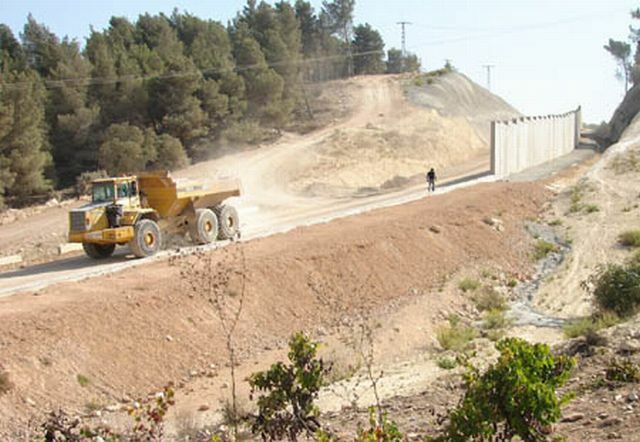 This stretched in a jagged course that was determined not only by Israeli military considerations but also by the special interests of settlers and land mafia lords, slicing through the hills, destroying their natural shape, gulping large swaths of Palestinian areas. Only in part did it follow the 1967 armistice’s internationally recognized border between Israel and the Palestinian territories, which has now been deleted from official Israeli maps. The ‘settlement blocs’ Israel planned to annex, which thrust like daggers into the Palestinian land, were now sheathed by the wall. Still, I was determined that none of this was going to prevent me from taking more walks in the hills. Not the military orders closing most of the West Bank, not the checkpoints and roadblocks and not the Jewish settlements. The more I read Shehadeh’s accounts of his walks, increasingly affected by the construction of new highways and concrete settlements on the hilltops, the more I began to wonder whether what he was describing would have occurred whatever the nature of the administration that ruled this land. Whether, indeed, he is describing a process that has overtaken treasured landscapes in almost every part of the world. And then, curiously, it seemed that Shehadeh began to arrive at a similar conclusion. Thinking in the long term made it possible for me to separate ‘the present’ from the rest of time and thereby realize that what Palestine and Israel are now would not necessarily be for ever. I was here on earth for a relatively short period and after that time passed, life would go on without my points of view, biases and fears. A road makes a scar in the hills but over time that scar heals and becomes absorbed and incorporated. Stones are gathered to build houses but then they crumble and return to the land, however large and formidable they may have been. … Empires and conquerors come and go but the land remains. Thinking in these terms, as well as writing about the experience of his parents and grandparents in the nakbah of 1948, has enabled Shehadeh to overcome his anger. 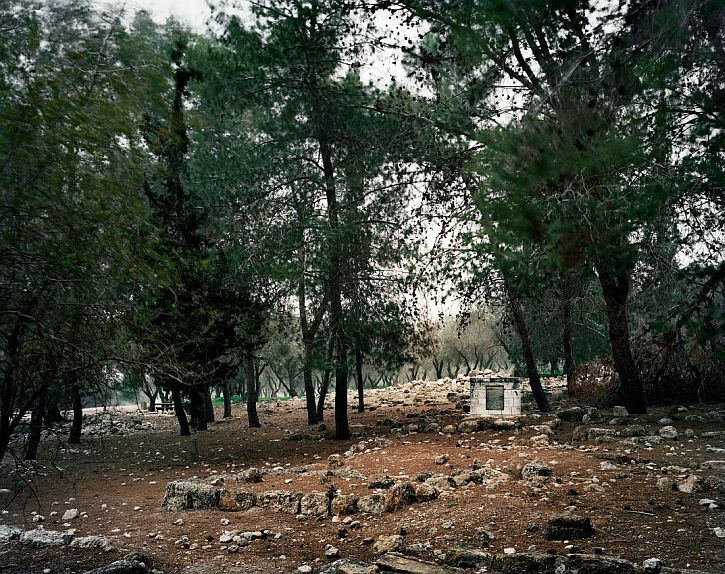 His book stands not only as an account of the psychological trauma of the Palestinian experience, it also illuminates the way landscapes become part of people and help define them. Slideshow: Raja Shehadeh narrates excerpts from Palestinian Walks. To bring our tired soul away from its long exile…. This year Nakba Day, the Palestinian commemoration of the Nakba, or catastrophe, of the 1948 war in which an estimated 700,000 Palestinians were expelled or fled, and hundreds of Palestinian villages were depopulated and destroyed, has been particularly marked by violence, reflecting the current unrest in the Middle East. 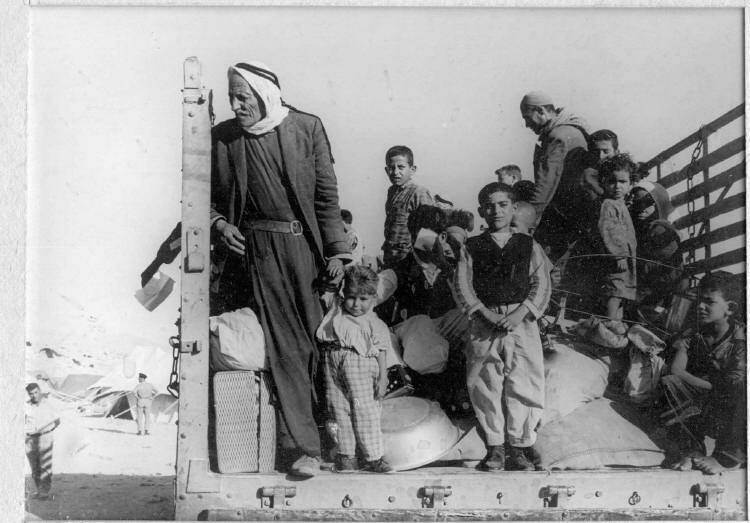 During the Nakba, the vast majority of Palestinian refugees, both those outside the 1949 armistice lines at the end of the war and those internally displaced, were barred by the newly declared state of Israel from returning to their homes or reclaiming their property. Today they number several million people, divided between Jordan, Lebanon, Syria, the West Bank and the Gaza Strip, with another at least quarter of million internally displaced Palestinians in Israel. It was this loss of Palestine and the dispossession and dispersal of the Palestinian people that came to be known as al-Nakba. All of this has been in my mind as well because I’ve just read Khirbet Khizeh, the novel of which Ian McEwan spoke in his Jerusalem Prize acceptance speech. 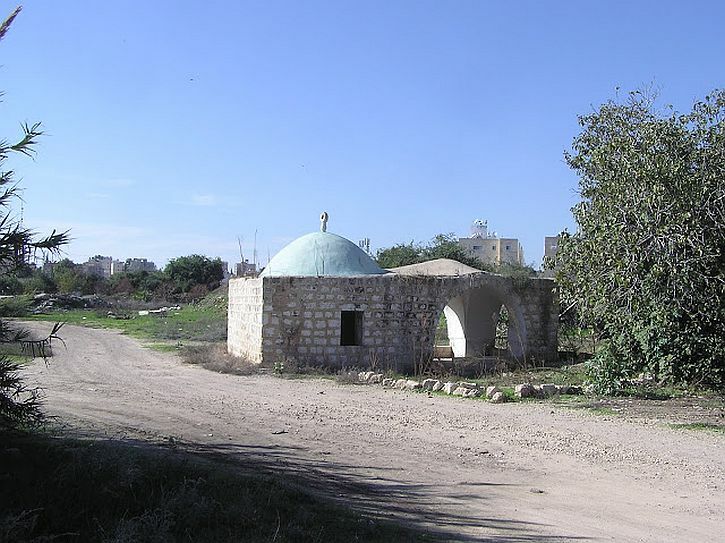 Khirbet Khizeh (The Ruins of Hizeh) was published in 1949 and tells the story of the expulsion of Palestinian villagers from their home and land during the 1948 war that immediately followed the founding of the Israeli state: the war of independence for Israelis, the nakba for Palestinians. The book was published under the nom-de-plume S. Yizhar, who was actually Yizhar Smilansky, an intelligence officer in the Israeli army in 1948. Yizhar was, as David Shulman writes in an afterword to the new Granta edition, ‘the first major writer to describe in credible, unforgettable detail one emblematic example of the expulsion of Palestinian villagers from their homes by Israeli soldiers’. Yizhar was a Zionist: he believed in the right of the Jews to the land. But the greatness of his book is that in Khirbet, he is a man at war with himself. The young Israeli soldier who is his main protaganist attempts to reconcile the rights of his people with the rights of the Palestinian villagers. Troubling thoughts and moral dilemma is ever-present in the thoughts of Yizhar’s central character. 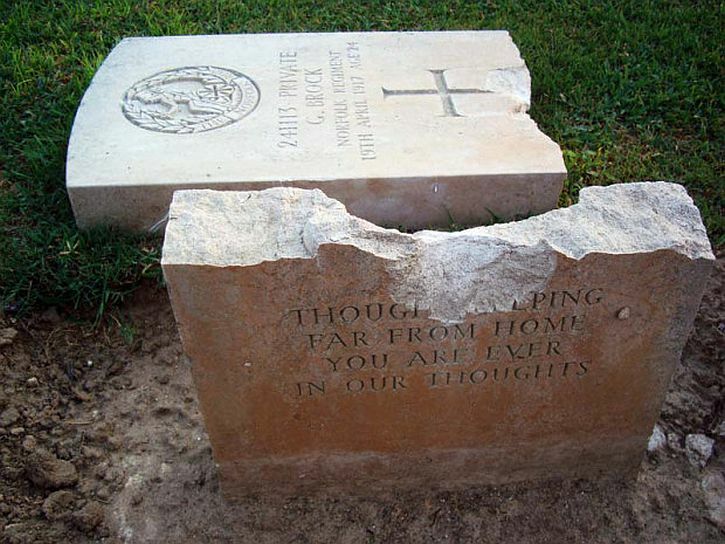 Near the beginning of Khirbet Khizeh, he speaks of the risks for a soldier of thinking about the actions on which he is engaged: ‘we knew that when the thoughts came, troubles began; better not to start thinking’. Are we killing them? We’re taking them to their side. Let them sit there and wait. It’s very decent of us. There’s no other place in the world where they’d have been treated as well as this. This was exile. This was what exile was like. This was what exile looked like . . .I have never been in the Diaspora – I said to myself – I had never known what it was like . . . but people had spoken to me, told me, taught me, and repeatedly recited to me, from every direction, in books and newspapers, everywhere: exile. Our nation’s protest to the world: exile! It had entered me, apparently, with my mother’s milk. What, in fact, had we perpetrated here today? 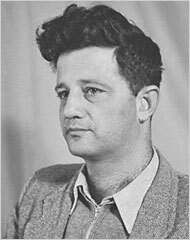 Yizhar Smilansky was born in Ottoman Palestine of Jewish settler parents, and was later a left-wing Zionist member of the Knesset. 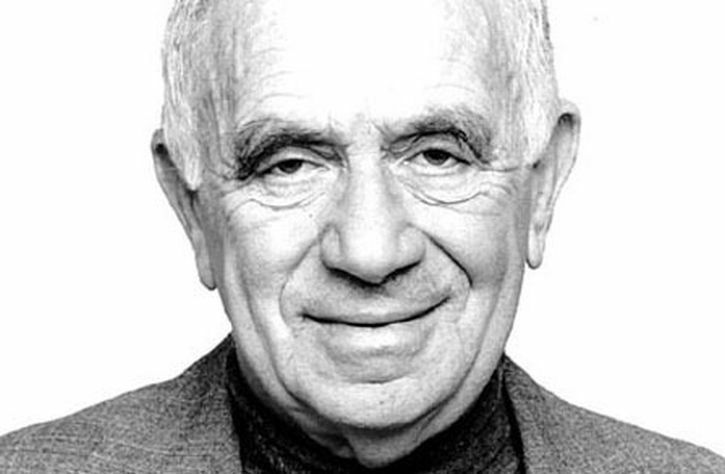 His writings under the pen name S. Yizhar contained some of the earliest and most powerful criticisms of Israel’s foundation from an Israeli Jewish perspective. The book was first published in Israel just after the end of the 1948-49 war, despite attempts by the military censor to ban it. Khirbet Khizeh remains an optional text on the Israeli school curriculum, the significance of which is debated by David Shulman in his afterword to the Granta edition. In the aftermath of the 1967 war that led to Israel’s occupation of the West Bank and Gaza, Yizhar wrote in an essay, ‘If there is indeed a ‘Jewish consciousness’, it must pause here to ponder our own selves …. What does victory by armed force actually bestow upon the victors? . . . Because you don’t get a country by means of weapons. Any such acquisition is unjust’. It is the abiding importance of Khirbet Khizeh … that it returns the issue of justice squarely to the heart of the nation, and then leaves it hovering – like the cry of the villages, or like the question that trails the narrator of the story as he wanders through the landscape: ‘some kind of question that posed itself of its own accord, or a kind of aside, that must be said’. The Israel-Palestine quandary has been churning around in my head lately (when does it not?). 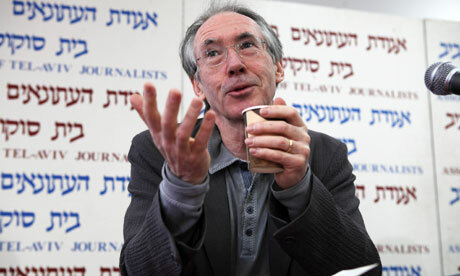 First there was Ian McEwan’s decision to accept the Jerusalem Prize for literature, a decision for which he was heavily criticised in a letter to the Guardian from a group called British Writers in Support of Palestine, including John Berger, and urged to boycott the award ‘a cruel joke and a propaganda tool for the Israeli state’, adding: ‘the Jerusalem book fair… is organised by the … municipality, a key institution of the Israeli state and a major instrument in the illegal colonisation of East Jerusalem’. Then there was McEwan’s acceptance speech which, in part at least, comprised an eloquent attack on ‘continued evictions and relentless purchases of Palestinian homes in East Jerusalem, the process of the right of return granted to Jews but not to Arabs, the so-called facts on the ground of hardening concrete over the future, over future generations of Palestinian and Israeli children who will inherit the conflict and find it even more difficult to resolve than it is today’ and called for an end to settlements and encroachments on Palestinian land. After rejecting the Palestinian call to boycott the state-sponsored Jerusalem Prize, Ian McEwan has massaged his conscience by demonstrating against home demolitions in East Jerusalem, criticising Israel in his acceptance speech, and donating his prize money to an Israeli-Palestinian peace group. Should his detractors …now ‘eat their words’? We think not. Had McEwan refused the prize, protested in Jerusalem at his own expense, and attacked not Israel’s “nihilism” but its colonialist zeal, his own words of condemnation would have had integrity and bite. As it is, McEwan has given Mayor Nir Barkat a golden platform for his outrageous views. 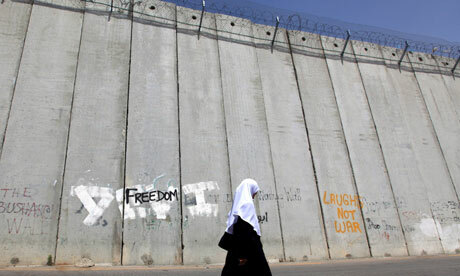 Jerusalem is not a city where all may “express themselves in a free way”. Activists are arrested and deported, while racist internal laws allow the municipality to flout the Geneva convention by creating illegal settlements – a policy designed to prevent East Jerusalem from becoming the capital of a Palestinian state. To criticise these settlements while accepting the laurels of those who build them appears rank hypocrisy. Where governments refuse to act people must, with whatever peaceful means are at their disposal. For me this means declaring an intention to stand in solidarity, not only with the people of Palestine but also with the many thousands of Israelis who disagree with their government’s policies, by joining the campaign of Boycott, Divestment, and Sanctions against Israel. The questions of Palestine, the Nakba, and the Wall were also central to the major four-part drama, The Promise, which screened on Channel 4 last month. 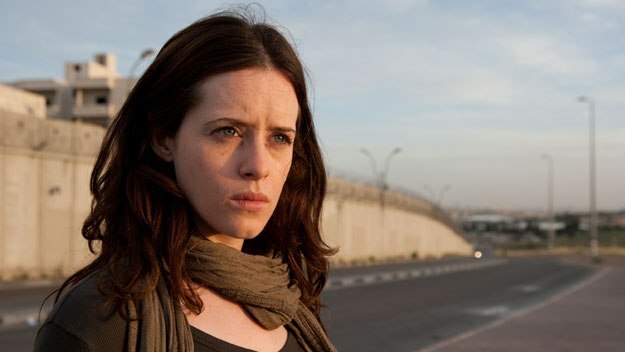 In terms of drama, it was noteworthy for the striking central performance by Claire Foy as Erin, a sulky, sullen teenager who (rather implausibly) decides to accept the invitation of her best friend Eliza, an English girl with joint Israeli citizenship, to accompany her to Israel during her gap year and stay with her well-off family when she is called up to do national service. Erin carries with her a diary kept by her grandfather when he served with British forces in Europe and in Palestine during the 1940s. Reading it, Erin discovers that her grand­father, served both at the liberation of Bergen-Belsen and in Palestine in the tense months before Israel declared itself a state in 1948, when the occupying British army was subject to a sustained terrorist campaign by Zionist groups. With this dramatic device, the writer and director of The Promise, Peter Kosminsky, was able to juxtapose issues in the present with the Mandate period and trace the connections – expressed symbolically by the key that Erin finds in her father’s diary. For her, the key is a mystery which she slowly unravels. It’s a symbol of the Palestinian refugees’ dispossession, still, 63 years later, the subject of continuing conflict and negotiation. But for all these faults,The Promise was still an exceptional drama. The two central performances by Claire Foy and Christian Cooke – playing her grandfather as a young man – were compelling. The cinematography brilliantly captured the sense of Palestinian streets during the Mandate and of the various facets of Israel today – from the dazzling houses of Caesarea, the country’s richest city where Eliza’s family lives, to the twisting streets of the occupied territories and the looming Wall. Above all, it was surely important that a drama that grappled with a crucial and unresolved issue of history – and Britain’s forgotten involvement – should be screened on prime-time TV. the luminous account of the clearing of an Arab village during the ’48 war, and of a protest that never quite leaves the throat of its narrator as the houses are demolished and the villagers driven from their land. It is a tribute to an open society that this novella was for many years required reading for Israeli schoolchildren. Well, I had not heard of that novel, but was intrigued to know more. Now, in today’s Guardian Review, I learn that the book is published in English this month by Granta. The short novel was written in 1949 and tells the story of the expulsion of Palestinian villagers from their home and land during the 1948 war that immediately followed the founding of the Israeli state: the war of independence for Israelis, the nakba or catastrophe for Palestinians. 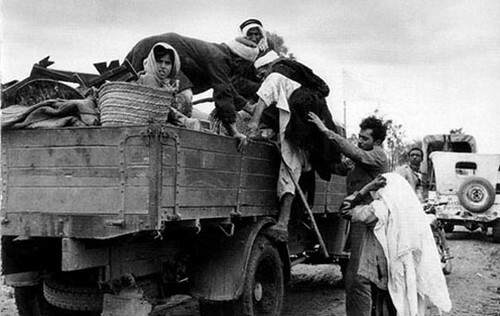 Khirbet Khizeh tells the story of the expulsion of Palestinian villagers from their home and land during the 1948 war that immediately followed the founding of the Israeli state: the war of independence or liberation, as it is referred to in Israel; for the Palestinians, the nakba or catastrophe. By the end of it, 750,000 Palestinians had become refugees. This story, this moment, is, to say the least, still controversial. In July 2009, Israel’s education ministry announced that the term nakba, introduced two years previously into Palestinian-Israeli textbooks, was to be removed on the grounds that its use was tantamount to spreading propaganda against Israel. In May last year, a law was passed – widely termed the “Nakba Law” – that withdraws government funding from any group judged to be “acting against the principles of the country”, which includes the commemoration of the nakba. The law effectively criminalises the right of the Palestinian people to remember. So the book really was, as McEwan said, an Israeli school textbook – but not any more. I shall have to read it.